Designworks first made contact with Trotec, during the summer of 2015 for an internal R&D project. Trotec are international manufacturers of advanced laser technology for laser cutting, engraving and marking. Over a 2 year period Designworks worked alongside the Trotec innovation division in Austria and the UK, during which the relationship between the companies grew. So when Trotec wanted to re-brand the laminate materials they offer, they saw an opportunity to utilise Designworks creativity. Designworks leapt at the opportunity to innovate Trotec’s traditional material catalogue and deliver a new communication tool for their customers. 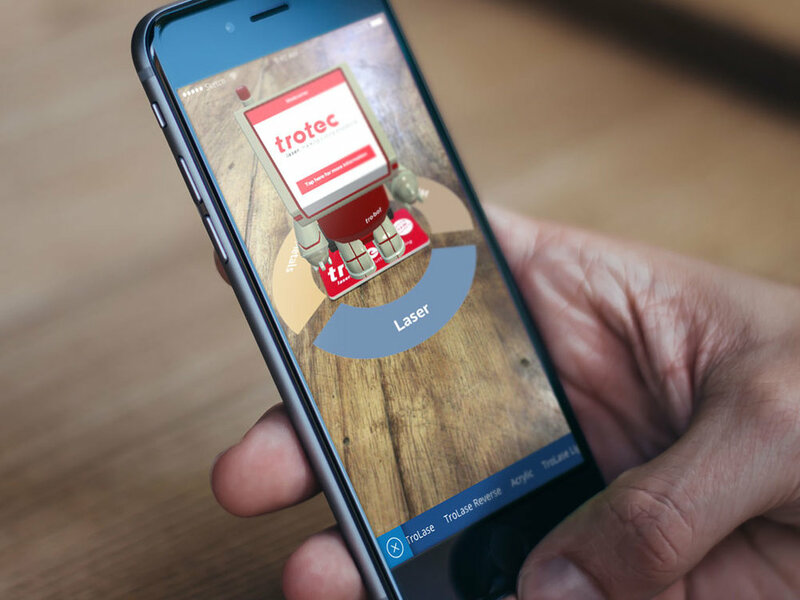 The brief was to create a memorable experience and simplify how the Trotec customer could navigate through hundreds of different materials using an App. The challenge was to create a visually clear yet exciting platform whilst also conveying all the technical detail required to for a user to make the right material selection. Designworks designed and developed the TroBot interactive materials library app from initial concept sketch, though to UI/UX design before launching the app on both Andoid and Apple platforms in Q1 of 2018 with Trotec still remaining a strategic partner.